WWE have put together a strong string of show’s lately with Payback and Raw both being up there with the best shows of the PG Era, this continued Friday Night on Smackdown with a number of good quality contests, as well as a little storyline progression heading into the A show on Monday. In a good move by WWE, the originally advertised main event of Daniel Bryan vs. Dean Ambrose was switched to re-match from the Raw match that was called off by doctor’s stoppage after Daniel Bryan suffered a “stinger”. Switching the main event allowed WWE to capitalise on what happened on Monday, whilst it was still fresh in the audiences mind and also allowed them to keep the story going between Orton and Bryan losing very little ground in terms of what was lost due to the ending of the Raw match. The show opened with Bryan coming out to talk up never having a match stopped due to injury before and it only happened this time because people viewed him as the weak link. Bryan’s development as a character has been interesting to watch over the last three months or so, although the weak link stuff is becoming slightly tiresome now. Bryan also talked about Orton hugging him after the finish and called Orton patronising, which drew Orton into the ring. I really enjoyed the dynamic between Orton and Bryan here, with neither playing what could be defined as a heel or face, with Orton saying he respected Bryan, but would hurt him in the match later on. The match between The Submission Specialist and The Viper was another exciting contest. It was hard hitting bout with neither Orton nor Bryan holding anything back which sold the seriousness of the rivalry well. There were a number of dangerous looking spots, including a Suplex attempt from Orton from the apron to outside, which sent Bryan crashing to floor. It looked pretty painful for Bryan, but certainly build him back up after the referee stoppage on Raw. Orton dominated most of the contest with Bryan helping to add a little something extra to Orton’s regular routine of rest holds with some nice transitions. The end came with both men hitting a number of impactful moves on the outside. Orton with a back suplex onto the barricade and Bryan hitting a diving running knee from the apron which resulted in a countout win for Daniel Bryan. It was a good ending, in terms of keeping the rivalry going, added to by the fact that Bryan refused to accept the victory, and will build up any future matches the two have, giving the final decisive winner a much more satisfying victory. I was pretty excited when this match was announced during the show, as I enjoy watching both Jericho and Del Rio in ring, even more since Del Rio’s heel turn, and thought they would mesh well together, we also haven’t seen these two face off for some time. I was a little disappointed that WWE didn’t play on the fact that Jericho and Del Rio had been partners the week previously, as this would have added a little extra spice to the bout. The match was not a disappointment though, with some great action throughout. The action was pretty quick throughout, with the pace of the match rarely dropping. As expect Del Rio and Jericho worked very well together, with both getting an equal amount of offense with the momentum switching quickly from wrestler to wrestler. Considering both men are over thirty five, some of the spots in this match were pretty impressive, with Jericho moving out of the way off Del Rio double footed attack, sending Del Rio throughout the ropes to the outside and Jericho even hitting the Lionsault which I’m pretty sure has never happened before! The ending saw some great chain wrestling from the two, based around the Walls of Jericho and the Cross Armbreaker. With Ricardo Rodriguez attempting to get involved, Jericho ended up putting him in the Liontamer. It was good decision to have Rodriguez get involved as Rodriguez was probably more over as a face then Del Rio was, and these kinds of actions will certainly help reverse that reaction. With Jericho busy, Dolph Ziggler jumped on Del Rio in the ring to give the World Heavyweight Champion the Disqualification victory. With the two biggest matches on the show ending in indecisive victory, it could have been a little frustrating as a viewer, luckily the matches went long enough, and had story developing finishes that left me wanting more, rather than feeling we had missed out on something. After the match, Ziggler continued to attack Del Rio until the Mexican Aristocrat managed to escape through the crowd. With Ziggler distracted by Del Rio, Jericho grabbed Ziggler and the two argued until Jericho hit the Codebreaker. I’m interested by this move and have begun to wonder if Jericho is turning back heel, although I’m hoping he isn’t added specifically to this rivalry. As good as triple threat has the potential to be, I’d much rather see a satisfying conclusion to the Del Rio and Ziggler storyline in the form of a one on one match. Jericho left the ring and Del Rio re-entered, having Rodriguez hold Ziggler, before delivering a Superkick. I liked this finish, as I felt it worked well in getting Ziggler over as a sympathetic face and will hopefully get people interested in seeing him finally get one over on Del Rio sometime in the future. 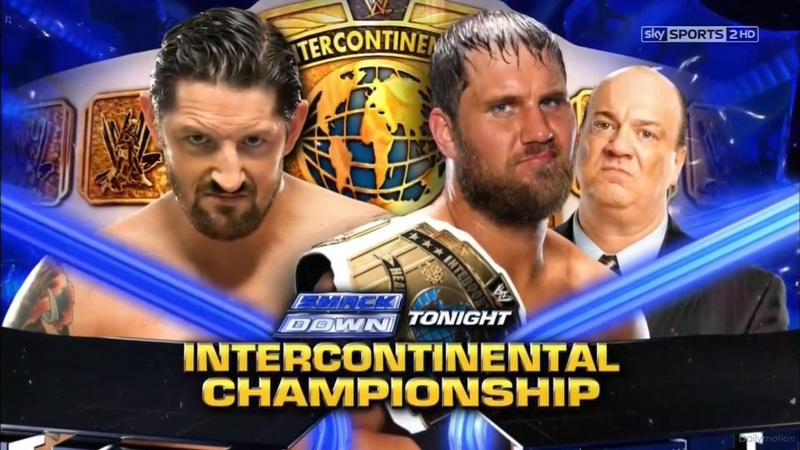 Wade Barrett also received his Intercontinental Championship rematch against Curtis Axel this week. Heel vs. Heel matches are usually interesting to watch on television but elicit very little crowd reaction as the crowd are unsure who they dislike the least and tend to sit on their hands. This was the case for this match, and certainly took a little of the shine off of what was decent battle between these two. Neither man really took control of the match with each have a period in control, before they headed for the finish, it certainly could have been paced bit quicker with the length of the match not really allowing for some of the slow methodical action. The end of the contest saw Barrett miss an elbow drop, with Axel hitting a hitting a Spinning Neckbreaker for the victory. It was a slightly disappointing finish, as we’ve seen both John Cena and Triple H kick out of that neckbreaker already and therefore it feels like a weak finish, and for me damaged Barrett by getting pinned after it. Axel had also debuted a new finishing move on Raw, so why not use it again here? After the match, The Miz who was on commentary entered the ring and looked to be attempting to get into a fight with Axel, as he began removing his suit. Personally, I was hoping Axel would knock the smug look of Miz’s face, which I’m pretty sure wasn’t the reaction WWE was after. The newly returned Christian was back in action on Smackdown taking on 3MB’s Drew McIntyre. Christian is extremely good at working these short television matches and manages to make even a four minute match feel action packed. Although it was clearly to help build Christian, a win over Drew at the moment means very little, as I don’t think he’s won a match in over a year. Christian picked up the win with a Killswitch after fending off all of 3MB. Unfortunately for Christian he could fend off The Shield, who attacked him after the match with a triple powerbomb eventually finishing Christian off. I’m interested to see where this goes, with Christian possibly challenging Ambrose for the US Title, or maybe even reforming his team with Chris Jericho to go after Rollins and Reigns tag title. Either way, I would definitely be interested in seeing those matches. Renee Young interviewed Paul Heyman backstage about what happened between CM Punk and Brock Lesnar on Raw. Heyman cut an unbelievably good promo about how this was personal matter and listed a number of things about Young’s personal life. It left the book still open on Heyman’s involvement in the rivalry and I’d hope that this continues for a number of weeks with Heyman disassociating himself from Lesnar, before he is finally revealed to be behind the attacks. It might be predictable, but would allow the rivalry to build well heading into Summerslam. Diva’s Champion AJ Lee was involved in a match with Natalya. It was another good outing for AJ Lee, against a Diva I’d like to see in action a lot more often on Raw and Smackdown. There was some good actual wrestling throughout with the finishing helping to build AJ’s submission hold with Natalya attempting to fight out but failing. With former champion Kaitlyn watching backstage with Layla, Aksana turned up and said something to Kaitlyn which caused her to get attacked with a bottle of water, before the rest of the Diva’s had to separate the two. I’m enjoying this new side to Kaitlyn and has certainly helped to make her a more dimensional character. The Damien Sandow and Sheamus rivalry also continued, with Sheamus facing off against Cody Rhodes. It was another decent match between these, although not much that we haven’t seen before. Sheamus kicked Damien Sandow for no particular reason towards the end of the match, it’s difficult to like Sheamus at the moment and this really didn’t help. Sheamus brought back the Cloverleaf hold to win by Submission. Sandow went on to retaliate Sheamus’ earlier attack, by delivering a kick to the head with Sheamus still holding onto the submission hold. I’m unsure how I feel about this rivalry because, to me, Sheamus feels a lot more like the heel within it than Sandow ever has. What have we learned from this week's Smackdown? 1. It's great to have something nearing the old Randy Orton back. 2. Jericho might be one of WWE's oldest regulars, but he can still go with the best of them. 3. The Miz is possibility the most unlikeable face character I have ever seen.